Seattle has a lot of very cool things to see. One that isn’t as well known, or at least not as well known as it should be, is the EMP Museum, which some call the “Sci-Fi Museum.” It earns that name. I’ve traveled around a good bit, and I enjoy museums, but I’d never seen or heard of one before dedicated to science fiction. This was an amazing place to visit. They have a little bit of everything there. On permanent exhibit (bear in mind that even the Smithsonian changes up what they show sometimes, so “permanent” might not “mean what you think it means”), they have an amazing array of costumes and props from movies that are known and loved. Behind a large wooden door that could be from a medieval keep or wizard’s tower, they have weapons from the Lord of the Rings movies, as well as Conan the Barbarian. The Cowardly Lion’s costume from The Wizard of Oz is on display, as well as Tyrion Lannister’s from Game of Thrones, and Jaret and Sarah from Labyrinth. If you prefer other items, how about costumes for Inigo Montoya, Wesley, and Buttercup? Or swords from those two heroes, with a six fingered glove and the dragon-headed katana from Highlander. 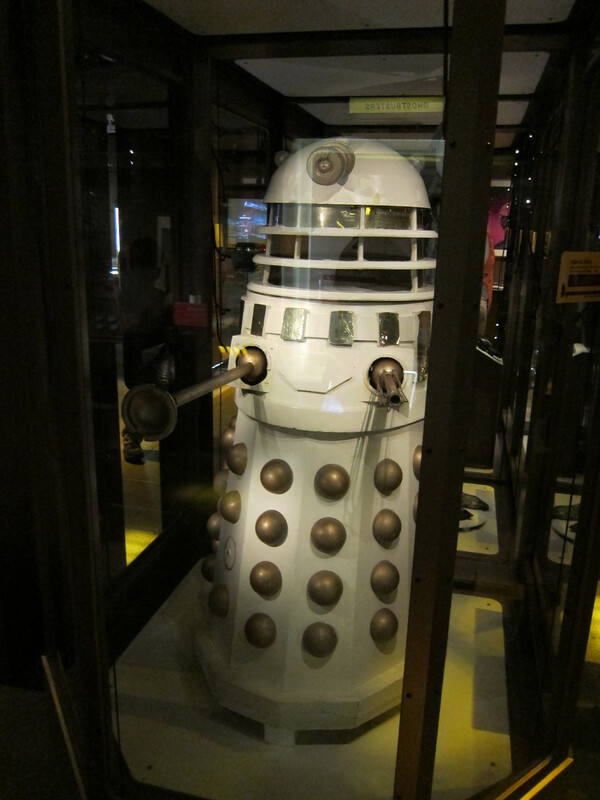 In a more sci-fi themed area, there is a Dalek and Cyberman from Dr. Who, a proton pack and trap from Ghostbusters, and robes and a Bat’leth from the Klingon Empire. 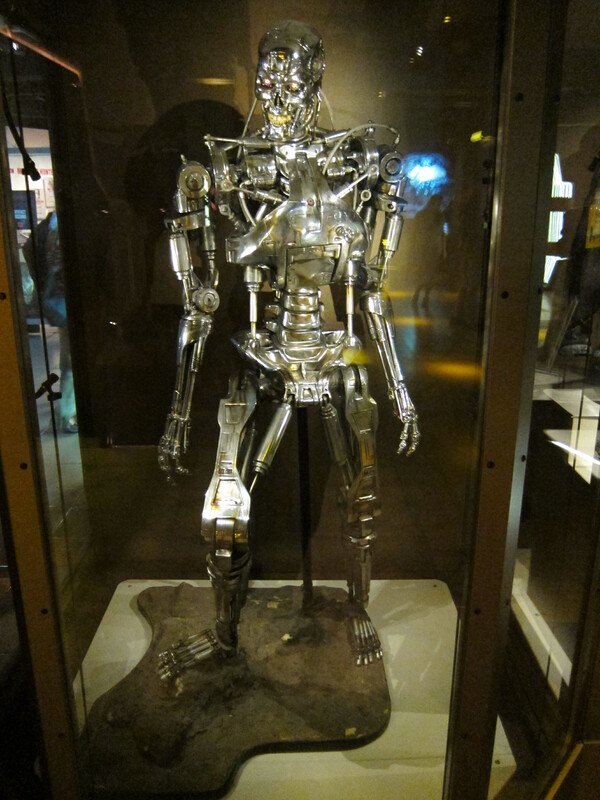 There’s also the gleaming metallic skeleton of a Terminator without its flesh covering. There are model ships from different movies, and a case full of blasters, lasers, and other sidearms. Prefer horror? There’s a basement room (where else would it be?) with scripts and props from a host of movies. There are monster props, a screen that turns your shadow into something fairly bizarre, and many screens with behind the scenes information on various horror classics. This isn’t my area, so I don’t as much detail on it, but even I could appreciate what they had. There’s also an amazing gift shop with t-shirts, toys, clothes, and much more from many different fandoms. When I was there, I was also very fortunate to see two different traveling exhibits. One featured costumes and some props from the Star Wars movies. If you’re a fan of those at all (I certainly am), this was amazing to see. Han’s costume, Chewie next to him. Ben’s robes. Vader’s armor, stormtroopers, and of course, the infamous Leia bikini outfit. C-3P0 and R2 were there as well. Aside from the many costumes were panels about the design and look of the moves in general and some of the characters. 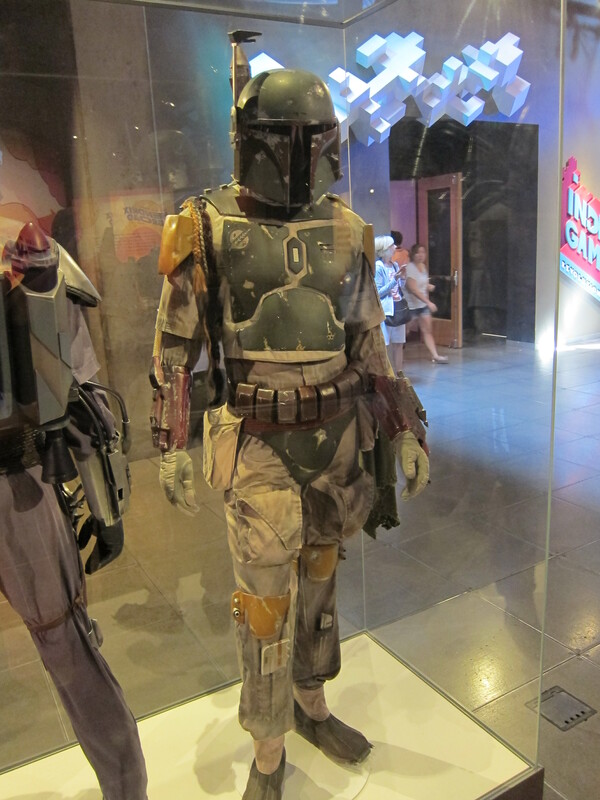 Elsewhere, off by itself, was the armor of the most famous of the bounty hunters, Boba Fett. On another floor was a display honoring Chuck Jones. Jones was one of the main animators for the early Warner Brothers studios. Bugs, Road Runner, Wile E Coyote, Elmer Fudd and many more are there. You can get your picture taken by Bugs’ rabbit hole, with the signs about “wabbit season” all around you. There are crates from ACME, of course, and displays showing the evolution of some of the early characters, as well as shorts playing on screens. And c’mon, who doesn’t love Warner Brothers? There’s a lot more to the building, and I could go on longer, but it really needs to be seen to be believed. The EMP Museum is near the Space Needle, at the end of the monorail tracks. That should be enough to let anyone find it. I hugely recommend it. My only complaint is minor- I saw things from about every fandom I can think of in science fiction and fantasy, save one. There was nothing anywhere that I saw, no mention at all, of Firefly. But even the best place can’t cover everything. I’d give the EMP Museum a 5 out of 5. If you get to Seattle, and you’re at all into any of the things I mentioned, I strongly recommend it.